Jonas Richter is 17 years old, he is from Porto Alegre Brazil and rides for NYC’s Bustin Boards. I got to know Jonas pretty well during his first visit to the United States in January of this year. Jonas is an all around great skateboarder with a focus on Downhill Racing and Free Riding. This “Brazilian Whiz Kid” has done very well in races and competitions in South America. So well that he was granted a deferred studies waiver in order to represent Brazil as an international skateboard racer. Jonas is in the middle of a three month North American tour. He has been at several big events in the Vancouver BC area. Last weekend he made his way to New York to compete at the Windham Downhill race. 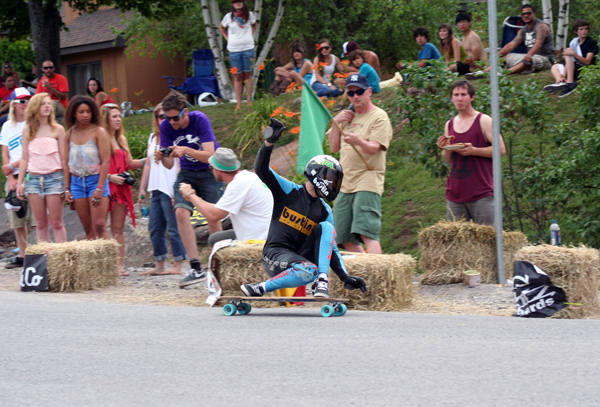 This week he is out in Goldendale Washington for the United States’ most famous downhill event, the Maryhill Festival of Speed. Jonas is at a critical age. At 17 he is still allowed to compete in the Junior division. He has several Junior’s wins, most recently at the Britannia Classic last month. Jonas has also been competing in the Pro Open division. He is doing very well standing up against the world’s top racers. He has earned the respect of everyone in the industry. At the Windham race last week he qualified with the 8th fastest time on the course. That’s out of a field of over 100 competitors. This is an awesome time for all disciplines of skateboarding. Talented young riders like Jonas represent the future of the sport. Hard work and a good attitude will take kids like him to the top. Sure Skateboards says Viva Jonas!! !